By early April we are usually panicked if pruning is not completed and the canes are not yet tied to the trellis wire. As of this writing we still have a lot of pruning left, but are very relaxed about it. The vines show few signs of movement (sap flow or bud swell). Normal bud break (the start of the growing season) is April 20. Given this morning’s snow showers, it is highly unlikely that will happen. 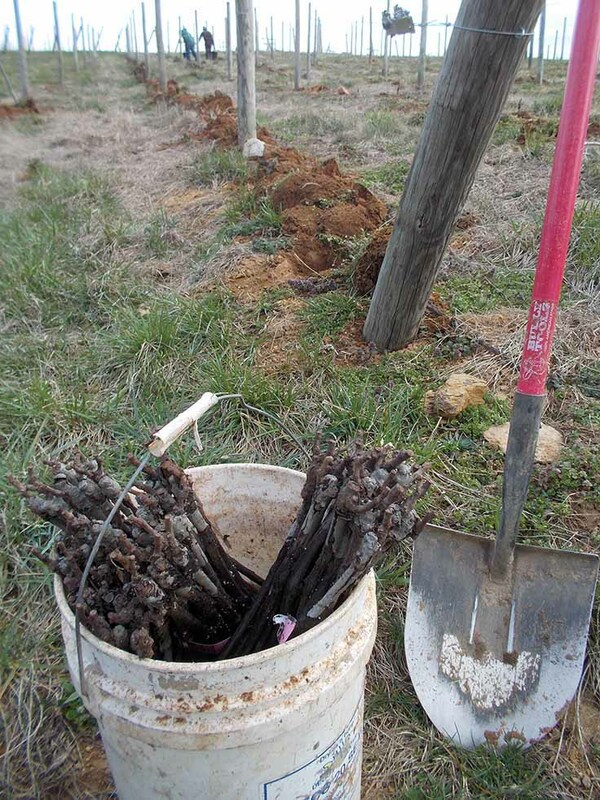 A late bud break can be an advantage as the chance of any frost damaging the vines is greatly reduced. However, a late start could result in a later harvest. White wines would be favored (they ripen first and will have no trouble achieving full maturity), but Cabernet Sauvignon and Petit Verdot may struggle if ripening needs to extend well into October. But it seems that I may be getting ahead of myself here. We are now open from 11:00 to 5:00 on Fridays, Saturdays and Sundays. Additionally, reserve Cellar Tasting will be held on both Saturdays and Sundays at 12:00, 1:00, 2:00, and 3:00. Planting has started! The cuttings of Cabernet Sauvignon and Cabernet Franc that we gathered over a year ago and sent to a nursery to be grafted and rooted are now back home in the form of young grapevines. Planting started last week. Each morning, shovels in hand, we dig holes every four feet under the trellised rows. The soil was ripped back last summer, so the digging is easy. Vines are meticulously planted by hand making sure the roots are spread out, the planting depth is correct and that the vine is positioned precisely under the trellis wires. We plant about 300 vines each morning. (This can be backbreaking work, so a half-day is quite enough!) By the end of the month Linden will have another 3,000 vines in the ground.